Somebody posted on plurk today asking whether we guys were pro-Batibot or pro-Sesame Street. As we all know, both were popular kiddie programs, one was popular in the US and the other, popular here in the Philippines. Both were shown on local TV. Cable was still non-existent during the 80s, thus, both were shown on free TV. I honestly could not remember any spectacular lesson I learned from both shows. Back then, my second parents were still my teachers in school, my yaya and the books I loved to read. So TV did not have a huge impact in my life back then. So I was asked on plurk whether I'm a Team Batibot or a Team Sesame Street. I answered Team Batibot. Why? Because Batibot was tailor-made for the Filipino child. My childhood would have never been the same if not for Ate Siena and Kuya Bodjie and Kiko Matsing and Pong Pagong and Kapitan Basa and Manang Bola. It is not like a Jollibee-versus-McDonald's thing since McDo, throughout the years, has been Filipinized. Thus obtaining that sweet Filipino spirit only Filipinos can truly decipher. Although Sesame Street was cute and the 1,2, 3, 4, 5, 6, 7, 8, 9, 10, 11, 12 song was addictive for a kid like me back then, it did not have a piercing effect on my childhood. 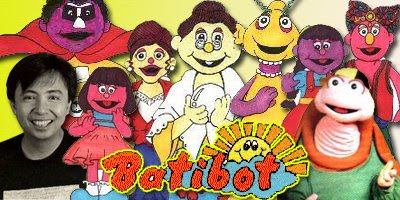 All I knew back then was that Sesame Street was American and Batibot was Filipino. Batibot makes me nostalgic. Sesame Street makes me sing the 1-12 song. Batibot wins for me.